Do you ever have days when you wake up feeling especially bright, happy, energised, out-going and confident? More ready than usual to take on the world and get things done? If you do, then you are experiencing the ‘Fire’ days of your own energetic – and, perhaps, menstrual – cycle. In the Chinese Five Elements, the Fire Element marks the peak of any cycle, a period of intensity, fullness, maturity, maximum expression. It comes at the end of an expansive phase of growth (Yang) and just before the cycle turns downwards into a contracting phase (Yin) of return to source. In our bodies, Fire’s energy is manifested in and expands out from our Hearts, the centre of our emotional selves and the home of our Shen (Spirit or consciousness). In Chinese medicine, the Heart is known as the all-powerful ‘Emperor’ of all our organs and bodily functions. In a world sorely in need of authentic feminine empowerment, being able to access our Heart’s Fire-phase radiance is the vital climax of a cyclical process that begins with quiet turning inwards. Our Heart’s energy is intimately connected to our womb space. Timely ovulation and the smooth turning of our whole menstrual cycle depend on a calm and happy Heart. Before exploring each of these factors, let’s take a closer look at how Fire’s intense energy manifests around and within our female bodies. Nature is in the Fire phase of her annual cycle as I write this in July, at the height of Summer. We humans, as natural beings, are also cyclical. Just like plants, our Fire phases come when – within the bigger or smaller cycles of our lives – we feel our energy expanding outwards to its maximum. These are times of ‘heat’, of drawing on all our resources, of peak activity, intensity and ambition. The fiery peak of our female menstrual cycle falls in the days around ovulation. Ovulation is the climax of the growth phases (proliferative and follicular) of the uterine and ovarian cycles. The rising oestrogen of these high-energy phases causes our womb’s lining to become lush and richly vasculated and, in our ovaries, a new egg to beat its competitors to fruition. At the moment of ovulation – an event triggered by and dependent on the balanced functioning of the Heart – that ripe egg is released. With our egg in search of a sperm, women are at our maximum fertility in those few days around ovulation. Many women find that this is indeed their Fire phase, the time in their own energetic cycle when they feel most authentically confident and powerful. I should note that some women may access their power most readily at another moment of their menstrual cycle, for there are other factors at play, like their lifestyle and alignment with the moon’s ebb and flow. Others – pre- and post-menopausal – do not menstruate, but it should nevertheless be possible to identify a cyclical energetic peak. If our Heart is off balance, we never experience the fiery peak of our cycle – be it in our lives or in our menstruality – in a healthy way. In our lives, we never enjoy the expansive glory of our own true Summer. This is either (if our Heart energy is weak) because fear and self-doubt hold us forever back or (if our Heart is over-stimulated) because we move instead into hyper states of manic, restless agitation and anxiety or of the false power of arrogance and tyranny. And, in our cycle, our ovulation can end up being early or late or not happening at all, leading to all kinds of menstrual and fertility issues. In the Yoga world, teachers often urge students to “Open Your Heart!” Not really being clear how to do that there and then in the class, I’ve sometimes found this a bit stressful, causing the protective strings around my Heart to tighten a little bit more. For, just as nature cannot suddenly break out into the fullness of Summer without the contractive clearing (Autumn), the restorative stillness (Winter) and the explorative re-emergence (Spring) of the previous seasons, nor can we. But many people do try to reach their peak by spending their lives stuck in a state that they might confuse for Fire. With its constant busy-ness and its struggling, striving and competing to get things done, they believe this the only way to get ahead and achieve their goals. But, while this linear way of living may have fiery intensity, it has nothing of the expansive, heart-opening joy of True Fire. In fact, instead of nourishing our Hearts into full bloom, it does the opposite. Just as Summer’s expansive heat drains resources and, so, cannot last forever, the stress of this unrelenting intensity stagnates in and exhausts our Hearts. The resulting energetic imbalance not only damages our physical heart and other organs, but it disturbs our Shen (Spirit), causing symptoms like anxiety, restlessness and insomnia or tiredness, emotional flatness and sadness – and upsetting the rhythm of our menstrual cycle. Opening our Hearts is a cyclical process that can only be achieved with time and care. What a relief it was to me when I understood this and discovered the framework of the seasons to guide me towards accessing my authentic power as a woman. Fire is the bright, expansive Yang (the masculine principle in the universe) peak of any cycle, but the source of its fullness and power is in the creative womb of Yin, the feminine principle. The Yin is internal, deep, dark, mysterious. It flows or is still like water and is cyclical by nature, connected to the phases of the moon. So, for women (Yin), embracing our cyclical nature and regularly turning inwards from our busy lives is fundamental to accessing the source of our power. In each cycle, times of reflection build self-transparency and refine our self-awareness (Autumn) and times of quiet, restorative stillness cultivate self-knowing and -acceptance (Winter). Only by embracing these two Yin phases can we remember who we are and access our unique gifts, thus paving the way for our vibrant emergence in pursuit of our true purpose (Spring) and our glorious self-realisation (Summer). I’ve been working for some years on becoming aware of and learning to accept and honour (in my life and in my Yoga and Qigong practice) the varying energy and quality of each of the ‘seasons’ of my own energetic cycle. As a woman, I have the gift of my menstrual cycle and my connection with the moon to help me in this process. Just as ovulation relates to the Fire Element and Summer, the other Elements and seasons are clearly embodied in the menstruation, pre-ovulatory and post-ovulatory phases. (More on this soon in another blog piece). By paying careful attention to how we are and what we need in each phase, we harmonise each one. This lays the groundwork for us to open our Hearts and move smoothly into the authentic power of our own Summer – and thus to also heal any Heart-centred disturbances in our menstrual cycle and fertility. For the Chinese, the Heart is one of the key organs involved in regulating our cycle. 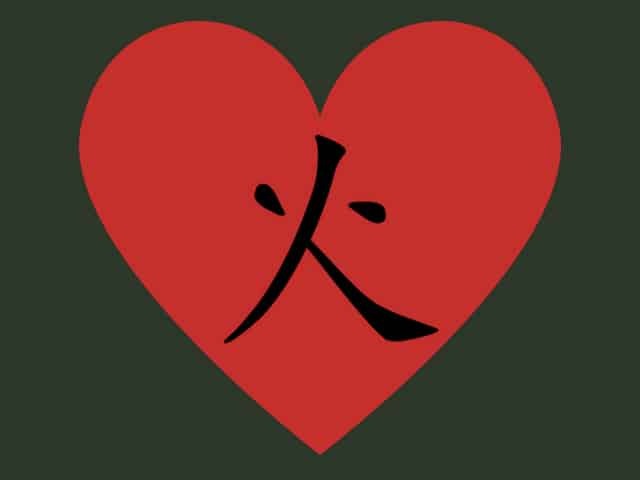 A healthy Heart allows for a calm and settled Shen (Spirit), so for emotional stability and, in turn, for all the stages of the menstrual cycle to flow smoothly. But when our Heart Qi is disturbed – be it by life’s ongoing stress or by shock, trauma or extreme emotion – this upsets the functioning of our cycle, causing irregularity, pain and fertility issues. The Heart (Fire) and the Kidneys (Water) maintain the cyclical balance of Yin and Yang within us. The healthy timing of our menstrual cycle depends on the harmonious rhythmical transformation of contracting Yin into expansive Yang and back again. Thus, the well-being of our Heart and our Kidneys is vital to menstrual health. The Heart has a direct connection to the Uterus through the ‘Bao Mai’ Uterus Channel. Heart Qi travels down this energy channel and determines the timely ‘opening’ of the womb/ovaries at ovulation and during menstruation to allow respectively for egg release and fertilisation and for the flow of menstrual blood. The Heart’s association with the mind includes the endocrine master glands, the hypothalamus and pituitary. So, in Western terms, the Bao Mai connection relates to the hormonal signals sent from the pituitary to influence our reproductive organs and to control the rhythmic turning of the whole menstrual cycle. This finely tuned system is easily thrown off balance by negative Heart energy that causes a glitch in the Bao Mai’s ‘opening’ signal. This can result in ovulation to be delayed or even stopped, as well as inappropriate uterine opening, giving rising to uncontrolled bleeding or miscarriage. Our Blood is, in Chinese as in Western medicine, governed by the Heart, which causes it to circulate freely through the body. While our menstrual Blood is believed to originate in other organs, it is nevertheless ultimately dependent on the overall state of our Blood. For instance, Blood deficiency can cause undernourishment of the womb lining and, therefore, delayed ovulation, scant periods, amenorrhea and conception issues; Heat in the Blood can lead to excessively heavy periods and Blood stasis my cause painful periods. Moreover, our Blood is said to anchor the mind, ensuring the emotional stability that is so vital for menstrual harmony. For all these reasons, Heart Qi imbalance is a common factor in irregular or absent ovulation and other menstrual disturbances that are perceived to have an emotional cause. The treatment? Regulating the Shen (Spirit) in the Heart or, in Western terms, relaxing and calming the mind. Yoga, Qigong, meditation, calming herbs and identifying and (when possible) removing negative stressors from one’s life will all help. But these will just be a sticking plaster if you do not also start to tune into and embrace your natural cyclical rhythm. I invite you to begin to honour your body’s calls to step away on a regular basis from intensity and to pass also through your seasonal phases of reflection, rest and re-emergence. When you do this, you’ll start to nourish, rather than drain, your Heart’s energy. So you’ll build the foundations for it to bloom into Summer radiance, thereby not only regulating your cycle but allowing you to step into the fullness of your power. If you’d like support in developing a Heart-nurturing Yoga or Qigong practice, do get in touch. WOULD YOU LIKE TO READ MORE POSTS LIKE THIS? International Women’s Day 2018 – What’s Changed? NurtureWorks - Helping women thrive with Yoga and Qigong in Cambridge, UK. EMBRACE YOUR CYCLICAL POWER - Sign up to receive my regular updates with lifestyle/Yoga/Qigong tips and insights, Yoga practice videos for nurturing women's health and well-being and details of upcoming events, retreats and class changes.